Matt Long is a transportation planning manager out PennDOT's central office in Harrisburg. He handles special initiatives and reporting for the Center for Program Development & Management, which means he and his team work closely with our 11 engineering districts, as well as the 24 Metropolitan and Regional Planning Organizations across the state. His team provides supportive applications to assist with the management and updating of the department's Transportation Improvement Program. Long officially started with PennDOT eight years ago, but was previously a consultant with the department as a traffic management center operator. Since joining the department, he has been able to advance professionally, and even received his master's degree in regional planning and a certification in Geospatial Information Systems. But Long is also proud of the department's abiilty to let him act as a public servant, both in the office and out. During the fall, Long volunteers with the Disabled Veterans Hunt at the Lanchester Landfill in Lancaster County. "Each fall, I take a day or two off work to go help with the Disabled Veterans Hunt," Long explained. 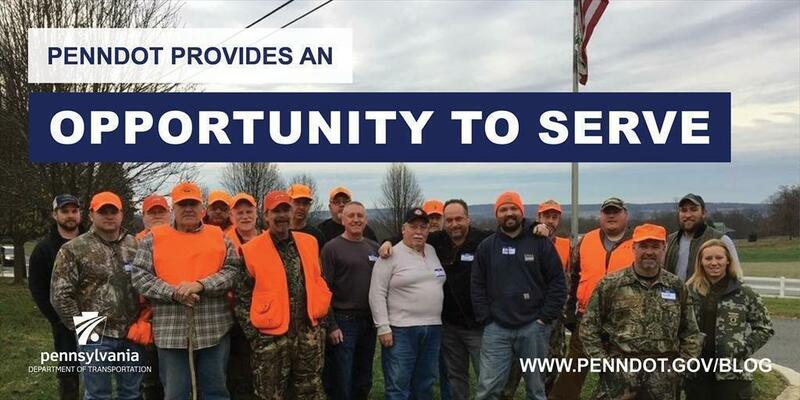 "It is a great time and a thrill to see the smiles of the veterans when they have a successful hunt." For more about employment at PennDOT, visit www.PennDOT.gov/jobs. To find open positions, visit www.employment.pa.gov​.